The PowerSun UV is a self-ballasted mercury vapor bulb with two main components. The first is a standard incandescent filament, which is the first to light. The second is a mercury vapor arc tube, which takes a few minutes to heat up. There will be a noticeable change in hue (or color) when the bulb is completely warm and fully functioning. Because the PowerSun UV is a self-ballasted bulb it can be used in any ceramic socket that is rated to handle the wattage. 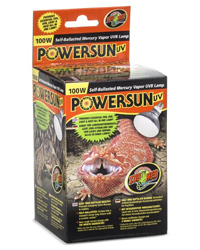 The PowerSun UV has nickel-plated threads to ensure that it will not corrode in humid reptile habitats. This new bulb also incorporates a short neck design, unique among mercury vapor lamps, that allows it to better fit into "clamp lamp" type fixtures.